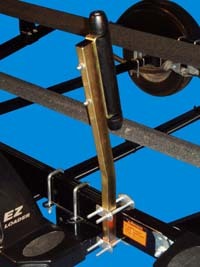 Boat Trailer Guides | Boat Trailer Roller Guide-Ons | VE-VE Inc. NOTE: These Roller Guide-Ons are QUALITY AMERICAN MADE Products, and you DO get what you pay for! Boat Trailer Roller Guide-Ons, T-900; Supreme model, 1 PAIR ( 1 ea. shown ) helps center boat in the most adverse conditions. Boat Trailer Roller Guide-Ons, Side Mount model, 1 PAIR (1 ea. 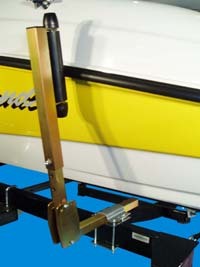 shown) use if boat beam width is AT LEAST 3" narrower then trailer frame width. NOTE: NO in & out adjust. on this model. Boat Trailer Roller Guide-Ons, T-920; Standard model, 1 PAIR ( 1 ea. shown ) helps center boat in adverse conditions. 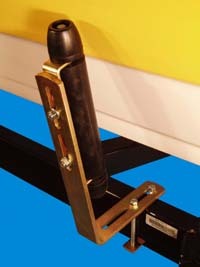 Boat Trailer Roller Guide-Ons, T-930; 3-Way Adjustable; 1 PAIR ( 1 ea. shown ) has a 13” overall length roller assembly that adjust up to 40” high, and has five different angle positions. PONTOON TRAILER, Roller Guide-Ons, 25" to 29-1/2" Tall. 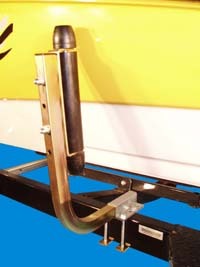 Mounts to the inside of boats pontoons on trailer frame cross member. T-902; "Side Guide Roller Assembly" has a 13-1/2"overall length. Priced and sold as 1 each. Slots in bracket give carriage bolts 1-3/8" of adjustment ( Center to center on bolts can be 3-3/4" to 4-5/8" apart ). "HOT DIPPED GALVANIZED FINISH", NOW AVAILABLE !! Click on "DETAILS" for information.